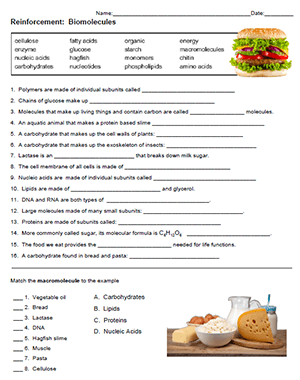 This worksheet is used with a unit on biological molecules in an introductory biology class. Students match definitions or descriptions to words provided in a word bank. The anchoring phenomenon in this unit is hagfish slime, which explains the inclusion of this concept in the list. Google Slides and Student Notes for the unit are available as well as the complete list of lessons used in this semester long class. Due to the short length of the class, most of the topics explore human biology and concepts I think are important for students to know in general biology. Most of the students in this class are vocational education students with no intention to move on to higher education. I have also given this exercise to my AP biology students as a way to review organic compounds, though it is a little easy for them. With the intro class, I often have students spend five minutes answering what they can, then working together to work out the other definitions. Eventually I project the worksheet on the board and have students write in the answers to check their own work. The answer key is available for TpT, but it is not difficult to work out for students or for teachers.